Springfield is the third largest city in Massachusetts, trailing Worcester by about 15%. Settled only 6 years after Boston, Springfield was originally part of Connecticut but defected after four years to join the Bay Colony, being burned to the ground during the 1675 King Philip’s War. An armory, created there during the Revolutionary War, was almost captured during Shay’s Rebellion in 1787, an event that helped precipitate the U. S. Constitutional Convention. Springfield was known for inventive residents and cutting edge manufacturing for over 2 centuries, including the first use of an assembly line (1819), the first American horseless car (1825), vulcanized rubber (1844), the first American gasoline car (1893), the first American motorcycle company (1901) and the invention of basketball (1891), the world’s third most popular sport. Although, like many American cities, during the last century its soil has been contaminated by lead and other heavy metals, the city is situated next to the Connecticut River on land that originally was among the most fertile in the Northeast. Early colonists found Native Americans growing tobacco in the Connecticut Valley and continued the practice. High quality shade tobacco production brought in migrant agricultural workers, some of whom settled in Springfield. Currently it is the most heavily Black and Hispanic of Massachusetts’ big cities, at 61% compared to Boston’s 42% and Worcester’s 32%. 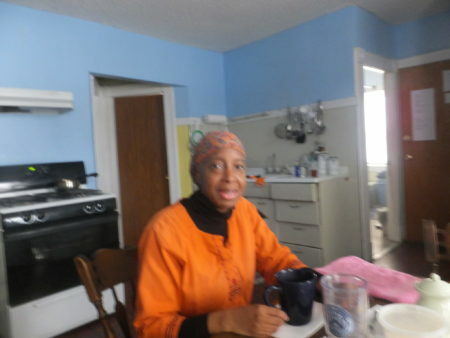 Anna Gilbert-Muhammad is the Food Access Coordinator of NOFA/Mass and lives in Springfield. She was born in New York City but, being the child of a Marine Corps father, lived in various places in California as well as Baltimore. While in California, although she was raised as a Roman Catholic, Anna became interested in the Nation of Islam and ultimately converted. “When I was in LA,” she recalls, “a friend invited me to a mosque event. It was such a fun event and they were such warm people I started going back, even though I was a pretty devout Catholic. I went to study sessions, congregational prayer, different events — particularly the learning ones. I enjoyed that kind of study. And I enjoyed the whole idea that prayer is a conversation between you and God. There are no intermediaries. You know the Catholics have saints, priests, a whole bunch of people between you and God. I went along with it but it was very confusing for me. In Islam there is a direct communication between you and God. You don’t need anybody else, which I appreciated. In 2005 Anna attended a retreat for single Muslims in San Antonio, Texas, and met her future husband. They conducted a long distance romance for a couple years, after which she moved to Springfield and they married. Clean up day in Gardening the Community’s Central Street Garden (owned by city and leased by GtC), one of the original Gardening the Community sites. “We bought a house which had plots in the back that were made for gardens,” Anna says. “He said: ‘You know how we’re always talking about the quality of our food? You should garden. We have the space for it now.’ I was like: ‘Yeah, right. That’s country. I’m not from the country!’ I was getting my nails done every two weeks. I didn’t want to get dirty. I didn’t think I had the time. I was worried things would die on me. But he kept going about it. 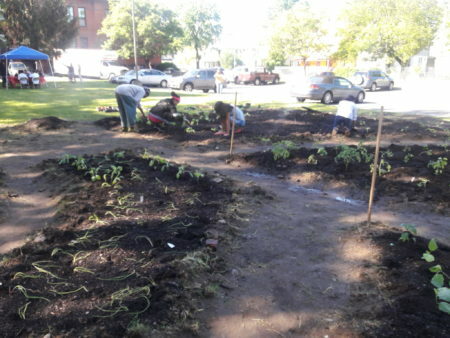 Anna started searching online for help and came across two organizations, NOFA/Mass and Gardening the Community (GtC), a Springfield youth gardening program that NOFA/Mass had helped start. GtC was meeting at the Martin Luther King Community Center in Anna’s neighborhood. She went there for a workshop on healthy soil, started going to more of their presentations, and got involved as a volunteer. At the same time Anna found NOFA. She thought her cabbage wasn’t growing right so she Emailed NOFA/Mass for help. They had a program called ‘Ask Ed’, where Ed Stockman, a NOFA farmer, would answer your questions. He asked Anna to send a picture of her cabbage, which she did, and he helped her understand how cabbages grow. This seemed like a helpful organization to Anna. When her husband asked if NOFA was giving any workshops they could go to, she found out they had a winter conference coming up in Worcester. “So we went to the 2009 NOFA/Mass winter conference,” she relates. “We get there and we’re standing in the registration line and looking around. He says: ‘Do you see anyone that looks like us?’ I looked around and said: ‘Noooo.’ But we stayed because we needed the information. So we went to the workshops and I was the only person of color at most of those workshops. We checked back with each other at lunch. What my husband liked was that during the general business meeting everything was handled quickly. It all seemed very well organized. I enjoyed the keynote speaker, Eliot Coleman. We got over the fact it was so white! Anna is responsible for the alliances of NOFA/Mass with groups working on food access issues. This includes a large number of indigenous urban farming organizations like GtC: community gardens and youth training programs as well as food policy and food sovereignty efforts. Since NOFA tends to be so rural and so white, I asked her some pointed questions about how best to be effective in alliances with urban groups that are largely composed of people of color. Anna has been participating in Food Solutions New England on behalf of NOFA/Mass. They are concerned about food security and are looking at ways to get as much as 50% of our food produced in New England – fruit, vegetables, fish, dairy, meat, everything. She sees food security and nutritional quality as unifying issues for NOFA and inner-city groups. Volunteers dig in at work party (with food, music, a Disc Jockey, and planting contests for children) opening the garden at Tapley Court Apartments, a 40-unit Springfield structure with some low income and some market rate homes. “Poverty is poverty,” she says. “In the rural parts of Massachusetts there are a lot of people who are food insecure, just like here. That in itself is something we can fight together on. Also, SNAP has been getting some rough treatment right now. Sometimes poor white people vote against their interests — their whole idea is keep the black and the brown and the red people down so whites will be one step up. But they are really not one step up. They’re in the same boat with me. You may have a little privilege being white, but you still can’t eat any better. We’re in the same food stamp line. “Lastly,” she concludes, “some of the public health institutes in the state are great about programs to improve nutrition in food deserts. We don’t necessarily have to lead the charge on those issues, but we can support groups that are carrying those banners. We can testify at hearings, carry articles in our publications, get people out for events. NOFA’s real strength in building alliances, Anna feels, is our knowledge about soil and how to raise nutritious, high quality food. 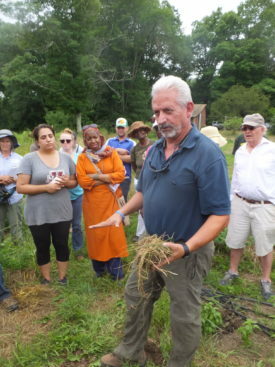 New England growing conditions are different from those many people of color are familiar with, and some of the crops they prefer are difficult to produce here. In addition, urban conditions present unique hazards that can’t be safely ignored. High soil levels of heavy metals, especially lead, require testing and often remediation, including raised beds, containers, and other approaches before crops can be planted there. Anna has been particularly supportive of the no-till and carbon farming work NOFA/Mass has been doing. These practices are not how she learned to garden, but the results – in terms of both usefulness for growing and quality of the produce – has convinced her to spread the word. “When I first started to garden,” she recalls, “it was all about: ‘go get the roto-tiller and till up everything’ every year. Make your regular rows and keep it moving. But to learn a different way that is better both for the quality of your food and also the environment, that is going to a different level. A lot of people want to learn about that. The gardeners that I have brought to NOFA have found that information very useful and are trying to use it in their gardens, planter boxes, backyards. When Anna talks about no-till, she says, she doesn’t get into all the ins and outs of what is going on in the soil biology. She just talks about what the grower can do to do a better job. Anna leads group of Springfield urban gardeners attending a workshop on soil carbon led by Ray Archuleta of NRCS at Many Hands Organic Farm in Barre. She feels strongly, however, about making sure the community group is in charge and making the key decisions. 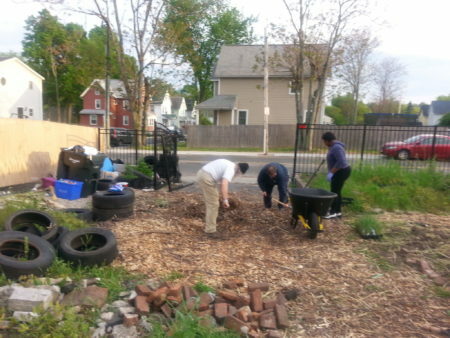 Gardening the Community, for instance, has alliances with different organizations to help out with growing, to bring in affordable CSAs into the city, and to learn about soil restoration to build up their soil. But GtC stays in charge of the agenda and decides what sort of help they need. “I think the most useful way to work in a community like this,” Anna says, “is to understand history – understand how we got to this point. A lot of times people come into our communities, do services, and leave. It is almost as if they make their living off of our misery, our suffering. This happens with a lot of social service agencies. For groups like NOFA, which she thinks has a wonderful program – to ask: ‘How can I be an ally?’ is the most useful way to approach forming an alliance. Take the back seat and let the group decide where they want to go. She also suggests that NOFA make its education events more accessible to communities of color. “When I first got involved,” she recalls, “all the workshops that I wanted to attend were way out. You needed a car for most of them. That took a lot of planning on my part to be able to attend. When we came to the Soils and Cover Crops one in Barre we had to arrange for a car and a car pool. If we did that same workshop here it could be on a bus line within walking distance for many people. Then more people would be apt to go. Maybe have a nominal fee like $5. I know we are a fee-for-service organization and have to pay for our programs, but could we make a sliding scale? Maybe the folks coming from Longmeadow could pay a higher price than the ones from Springfield (laughs). Just a thought! “But when it comes to workshops,” she continues, “ask: Is it accessible? Are we covering topics that make sense to people? How is it advertised? For the workshop UFI has coming up this weekend we’re making it a point to push it in the Dorchester/Mattapan area, in the neighborhoods that people can walk from. They’re marketing it to other organizations in the area, youth groups, neighborhood associations, to reach all the people of color in that area. Anna also has some suggestions for making an organization’s staff and board more inclusive. The will to do that has to be serious, she feels, and recruitment is often necessary. NOFA’s strongest asset, Anna reiterates, is the fact that we are trying to solve problems, make communities stronger, people and the earth healthier. People who believe in those things will be attracted to it.